JUST WHAT IS THE CELEBRITY ARCHIVE? Originally started as a film buff's private hoard, others like yourself soon became aware of this collection and requested copies of their own. 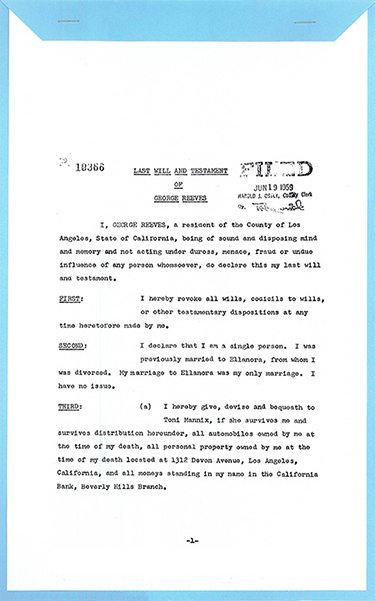 The collection of documents contained in this web catalogue consist of true copies of 700 notables' Last Will and Testament, probate files, autopsies and divorce files. These famous names include film makers, authors, politicians, artists, musicians, and the just plain famous. The majority of our documents are pulled directly from court files from within the United States and abroad. We have also done private research for years, on behalf of writers, biographers, the media and other researchers. AND WHO USES THE CELEBRITY ARCHIVE? give it a wholly authentic look, as well as to preserve it.